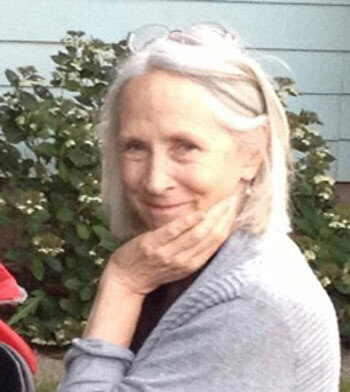 Maggie Donahue has been an avid student of Zimbabwean music since the early 80’s when she studied and performed with Shumba, Eugene’s first marimba band. It was her good fortune to learn directly from Dumisani Maraire, who is credited with introducing the Northwest to Shona music. 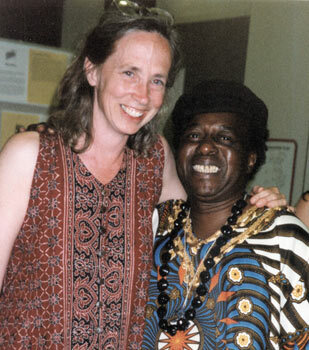 His guidance formed the basis of Maggie’s teaching style and his encouragement led her to found Kutsinhira Cultural Arts Center, a 501(c)(3) non-profit in 1991. Since then, she has taught marimba to students of all ages, children to elders. Through Kutsinhira’s residency program she has continued her study with Cosmas Magaya, Beauler Dyoko, Musekiwa Chingodza and Patience Chaitezvi Munjeri. A particular joy for her is to work with students who love the music but have not had the opportunity to play. John Mambira is originally from Bulawayo, Zimbabwe and now resides in Eugene with his wife and children. 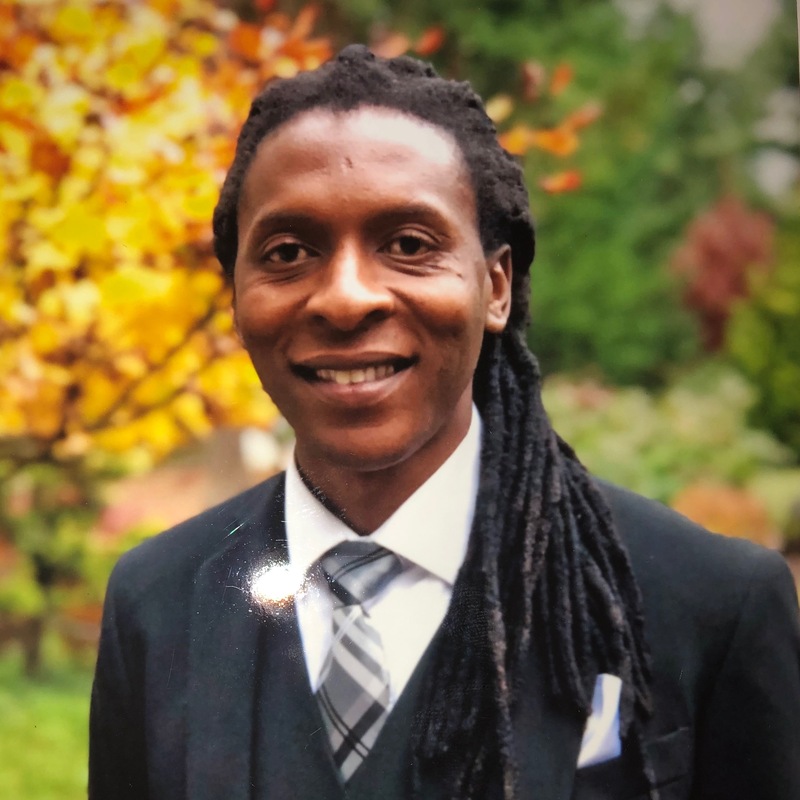 He first came to the United States in 2007 and has taught both children and adults Zimbabwean drumming, dancing, marimba and theater arts in workshops and classes throughout the Pacific Northwest. He is a founding member of the award-winning band Bongo Love, which received the Ethno-Music National Prize in Zimbabwe in 2006. Like many of us, Gary was hooked to the music the first time he heard it, over 25 years ago. He has played marimbas since 1992 and taught as a teacher for 21 years through the Kutsinhira Cultural Arts Center. He enjoys teaching at all levels and has been recognized by many students as a patient and effective teacher. 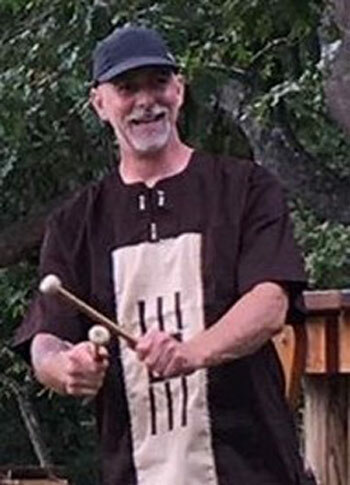 Gary is a founding member of Zambuko, a performing ensemble in Eugene, has played with Shumba of Eugene, and was director of the Hokoyo youth ensemble. Gary recognizes one of the greatest gifts of the music to be when an aspiring player lights up with the joy and thrill of playing this amazing music from Zimbabwe. 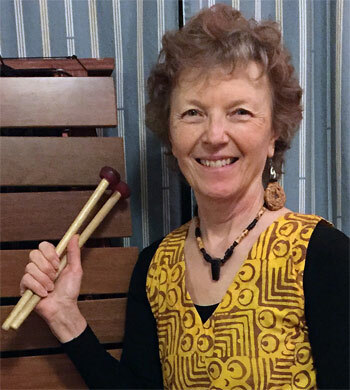 Wanda Walker has taught marimba at Kutsinhira Cultural Arts Center in Eugene, Oregon since 1999, privately since 2002, and at the Zimbabwean Music Festival (Zimfest) since 2003. She performs with Kutsinhira marimba ensemble Jenaguru, as well as Mudzidzi mbira group. Wanda has studied mbira, singing, dance, drum, and marimba with many Zimbabwean musicians, including Cosmas Magaya, Musekiwa Chingodza, Ambuya Beauler Dyoko, Chartwell Dutiro, Sheasby Matiure, Patience Chaitezvi Munjeri, Irene Chigamba, and Paul Mataruse. 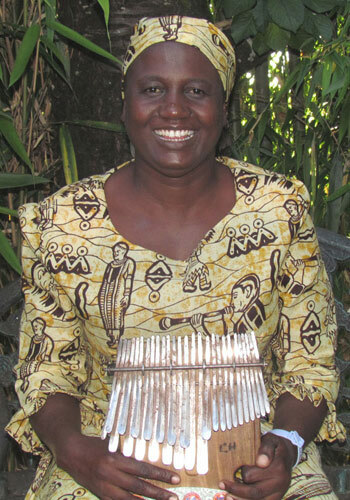 Wanda has arranged several traditional mbira songs for marimba and has developed a fondness for teaching young people. 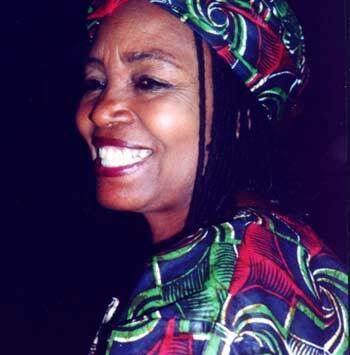 Beauler Dyoko was Zimbabwe’s first female mbira recording artist. Ambuya Beauler had a vibrant singing style, presence, and warm personality that well represented her culture. She was the leader and featured singer with the popular contemporary mbira ensemble The Black Souls, and she also performed with the Mhuri yekwa Rwizi/Soul of Mbira groups, and with Cosmas Magaya, for many years throughout the world. Ambuya Beauler was also a spirit medium, an herbalist, fashion designer, and teacher of traditional Shona cooking. She promoted women musicians in Zimbabwe and wrote original songs in support of AIDS awareness and non-violence. She was for many years the sole supporter of a large extended family of grandchildren, nieces and nephews in Zimbabwe. Ambuya Dyoko was loved by her many students, friends, and fans of mbira music, and she is deeply missed by us all. Born in Zimbabwe in 1953, Cosmas Magaya grew up in the rural area of Mhondoro. His father, Joshua Magaya, was a highly esteemed n’anga (healer), and a farmer who was noted for his enlightened farming practices. Cosmas first became interested in mbira at the age of eight and begged his older mbira-playing cousin, Ernest Chivanga, to teach him how to play. However, because of his youth, he wasn’t taken seriously and wasn’t allowed to touch the cousin’s mbira. At every opportunity, Cosmas would “borrow” the mbira and, out of hearing, try to pick out what he could remember from his cousin’s playing. On one momentous occasion, after he had been practicing secretly for many months, Cosmas played mbira for his family. They were astonished that he had taught himself to play and his cousin began to teach him more songs. The two were hired to play frequently for Shona religious ceremonies called bira, and Cosmas developed a reputation as a strong mbira player whose playing could call the ancestral spirits. He was quite small for his age and played the mbira inside a huge deze (calabash). The image of this young boy, all but hidden by the calabash, with just his small legs sticking out, was one that greatly amused his audiences. Throughout his youth, Cosmas sought out opportunities to expand his mbira song and stylistic repertoire from both elder teachers and his age group peers. In addition to his mbira studies, he completed his formal schooling and went on to study business at the Community College Business School in Salisbury. Cosmas spent many years working for the sales and promotion division of the Dairy Marketing Board as a sales representative and manager. As his music career developed, he joined Hakurotwi Mude’s ensemble Mhuri yekwaRwizi and made two European tours in 1983 and 1985. He still performs with his family group, Mhuri yekwaMagaya, which now includes his son Mudavanhu. Cosmas has gained loyal following of many mbira students throughout the United States and Canada, and he continues to teach and perform in the U.S., Canada and Zimbabwe, spending part of every year in each area of the world. Abraham Dumisani Maraire (27 December 1944 – 25 November 1999), known to friends as “Dumi”, was a master performer of the mbira, a traditional instrument of the Shona ethnic group of Zimbabwe. He specialized in the form of mbira called nyunga nyunga, as well as the Zimbabwean marimba. He introduced Zimbabwean music to North America, initiating a flourishing of Zimbabwean music in the Pacific Northwest that continues into the 21st century. Dumi is credited for his famous 1–15 number notation used on the nyunga nyunga mbira and for notating the song “Chemutengure” on the nyunga nyunga mbira. The song “Chemutengure” is used to teach mbira learners the technique of playing the instrument. 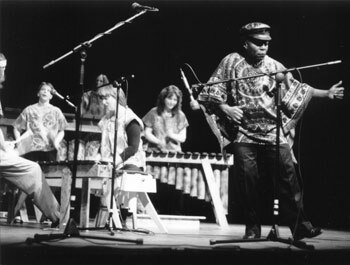 Dr. Dumisani Abraham Maraire, performing with Musasa Marimba on Sunday 20 March 1994 at the San Juan Community Theatre in Friday Harbor, Washington, USA. Photo by Paul Novitski. 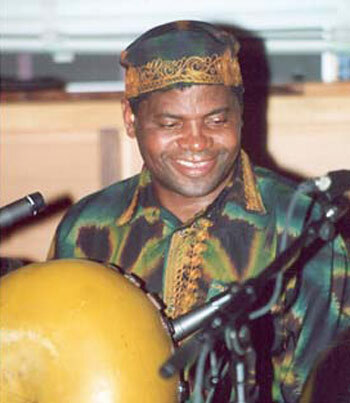 Musekiwa Chingodza was born into a family of great mbira players in Mwangara village, Murewa, Zimbabwe, in 1970. He began playing mbira at the age of five and is self-taught. Through listening to other gwenyambira, or great mbira players, he developed a strong attachment to and love for mbira music. He says, “Our music is both medicine and food, as mbira has the power to heal and to provide for people. Mbira pleases both the living and the dead.” In 1991 Musekiwa was a key member of the band Panjea, founded by Chris Berry, and composed the hit song “Ganda” on Panjea’s Zimbabwean album. Musekiwa previously taught mbira at Prince Edward School in Harare for many years, and continues to be in demand to play mbira at ceremonies in Zimbabwe. He is an excellent singer, dancer and drummer and plays both mbira dzavadzimu and nyunga nyunga. Following up on his widely acclaimed CD with Jennifer Kyker, entitled Tsunga, Musekiwa released his CD VaChingodza Budai Pachena; his solo CD, Kutema Musasa (2005); a second collaboration with Jennifer Kyker, Muronda Tsimba (2009); and his latest CD (with Bud Cohen), Tomutenda Mambo (2011). Musekiwa is also an accomplished ngoma (drum) player in the Shona tradition, and he excels in playing hosho (gourd shakers), singing, and traditional dance. He is very experienced at teaching all of these skills to North Americans in a friendly and supportive way. 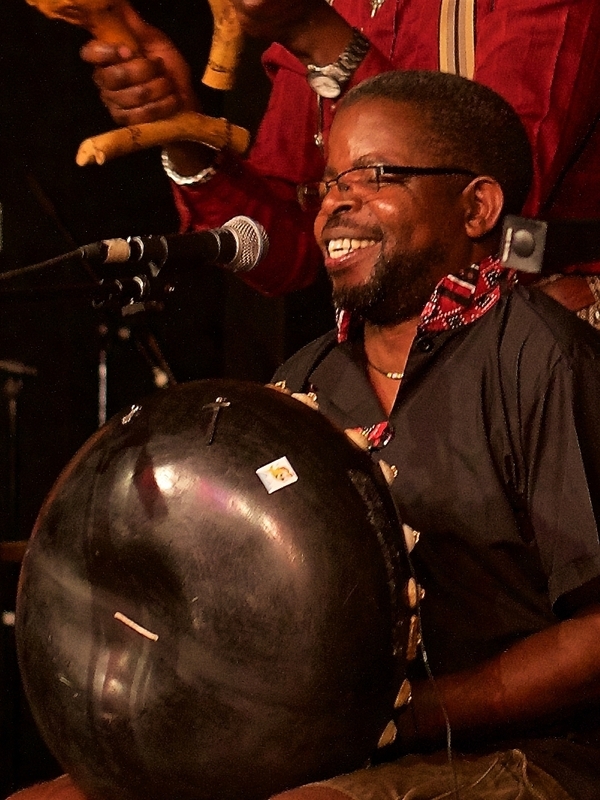 Musekiwa has enjoyed many successful North American tours, often accompanied by his friend and mbira partner Bud Cohen. With his engaging personality, gentle teaching style, virtuosic mbira playing ability, and deep immersion in his culture, Musekiwa is almost always asked to come back for repeat visits. Patience Chaitezvi Munjeri, one of Zimbabwe’s rare women mbira players, has played in traditional ceremonies since she was very young. Because her mother is a traditional healer and medium and her brothers also played mbira for the spirits, Patience grew up immersed in mbira music and deep Shona culture. She has earned a university degree and communicates very well in English. Three successful tours through the U.S. and Canada (in 2008, 2009, and 2011) confirm Patience’s ability to convey musical as well as cultural content to her students. Patience takes her teaching role seriously; patient yet precise, she brings energy and authenticity to all her classes and performances. Patience has consistently proven her ability to teach mbira, drumming, hosho (shakers), traditional dance, traditional singing, choral singing, and Shona cooking. She also offers presentations on Shona culture for academic and public audiences. After each tour, Patience returns to her family in Chinhoyi, Zimbabwe. There, she teaches in a high school of 2,000 students, 765 of whom are orphaned. She advocates for these children and manages to work with a handful of mbira students between teaching her scheduled classes.